Tonight, orchestrally-inspired synth poppers the Wombats are at the Hammersmith Apollo with support from Team Me. Wednesday's big ticket will be Tim Burgess and Mark Collins of the Charlatans playing an acoustic set at Union Chapel. If you'd rather something lo-fi, brash, and full of reverb, Woods will be at Bush Hall. Friday, alt-acoustic troubadour Jack Cheshire is at Filthy McNasty's. He's supporting Roddy Woomble at Union Chapel in a couple of weeks, so this is a good chance to see him in a low-key setting first. Saturday, Brighton folk-punks the Levellers are at Brixton Academy playing Levelling the Land. In keeping with the folksy vibes, blues artist Duke Garwood and his band will be at Café Oto. Sunday is the Women in Country Music All-Dayer at the Lexington. Artists performing include the Piney Gir Country Road Show, Adeline Vesta and Eliza Newman. 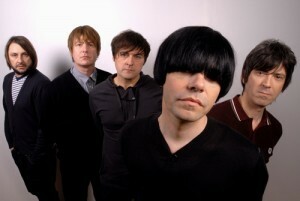 Photo of the Charlatans by Tom Sheehan via the band's website.